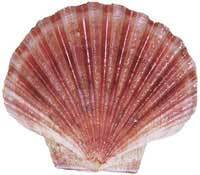 Also known as Southern Scallop or Commercial Scallop. Tasmanian scallops have a thin shell, nearly circular and strengthened by radiating ribs. In life the scallops rest on their paler, more convex lower valve which slightly overlaps the darker, flat or slightly concave upper valve. Tasmanian scallops are found in Australia's southern waters from mid New South Wales down and around to mid Western Australia. 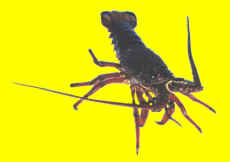 They are found to depths of at least 120 metres over bare, soft sand or mud. Scallops feed by filtering plankton and detritus from the water. They are preyed upon by starfish and octopus. 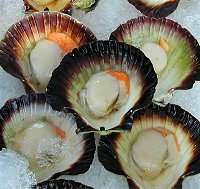 Tasmanian scallops are taken commercially in NSW, Victoria and Tasmania. They are caught using box-shaped mud dredges 2m to 3.5m wide. The dredges may be fitted with teeth. As the dredge is dragged along the bottom, the teeth dig into the mud, lifting the scallops so that they are caught in the dredge basket. Each dredge run lasts up to 15 minutes, after which it is lifted and emptied. The boat then reverses direction and fished back the other way. Scallops belong to the Pectinidae family. They have fan-shaped bivalve shells with deep ridges that radiate from the hinge. Colours are variable, including brown, orange, yellow, pink or flesh-coloured or a mix of these. The upper valve of the shell is flat, and the lower valve is concave. Taste, Texture Scallop flesh is white and the roe is usually bright orange. Scallops are strong and rich in flavour with a medium -firm texture. They are popular grilled or barbecued, but avoid overcooking, which causes shrinkage, or the use of too much salt. Grill under a salamander, then drizzle with lime juice and olive oil, or sprinkle with fresh lemon zest and cracked pepper. Combine with coriander, avocado and chilli salsa on a crispy pappadum. Scallops are tender with a sweet, nutty flavour. The roe is pink with a firm texture when cooked. Create the perfect party dish by deep frying scallops in a tempura batter and serve with a soy, ginger and garlic dipping sauce, or present a potpourri of deep fried seafood types such as prawns, oysters, mussels, finfish, calamari and scallops with tartare, aioli, remoulade and fresh citrus juices. Scallop roe also provides excellent flavour for pates, soups or chowders. Scallops can be used in some recipes as a replacement for crab meat or lobster. Place scallop on board with flat shell up, insert the point of a strong paring knife between the shells, and run it across the underside of the top shell to sever the internal muscle. Pull shells apart. Slide knife under Scallop to free it. Lift our Scallop and pull off skirt and gut, leaving white Scallop flesh with coral attached. Remove any dark membrane adhering to Scallop flesh. Rinse well and drain. Wash and dry bottom shell to use as a receptacle for cooking and serving Scallops. Don't thaw them in the microwave, they are to delicate and you will start to cook them. The best method for thawing is to place them the refrigerator for 24 hrs, and then rinse lightly before cooking them. If time doesn't allow for an overnight thaw, place your scallops in a zip-lock bag and run cold water over the bag till they are thawed. Scallops are harvested by dredging in deep offshore waters. For maximum freshness, all processing is done at sea where they are cut, washed, bagged and stored on ice or frozen at sea. Sea scallops are commonly harvested with dredges or bottom trawls on gravel, sand, or sand-mud bottoms. Sea scallops are shucked and chilled on the boats after they are caught, this is due to the fact that they cannot live out of water. Another way of harvesting scallops is by diving for them. You will often times see "diver scallops" advertised in stores or restaurants. Diver scallops are harvested by hand in about 50 to 100 foot of water and often times in very poor visibility. Most of the diver scallops you will find will be the larger ones and will be less gritty than dredge harvested scallops. 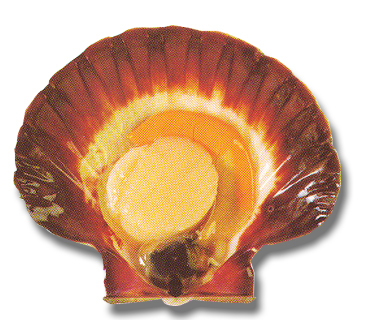 Flesh with roe (commercial scallop): 20% of total weight (in half-shell), Flesh without roe (saucer scallop): 15% of total weight (in half-shell). The Tasmanian scallop fishery is primarily based on the harvest of the commercial scallop (Pectin fumatus). Although commercial fishers can legally take the doughboy scallop (Mimachlamys asperrimus) and the queen scallop (Equichlamys bifrons), they have virtually no commercial significance in Tasmania. Grading can vary by supplier and region. Examples of grading systems for scallops are presented below. 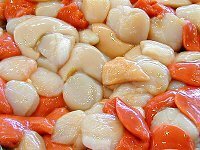 Terminology such as U-100 or U/100 is pronounced under one hundred and refers to the number of scallops per a specified weight (pound or kilogram), in this case fewer than 100 scallops per pound or kilogram. '10-20' is pronounced 'ten twenty' and means that there are from 10 to 20 scallops per pound or kilogram. Dept. Primary Industries Parks, Water and Environment, Tasmania - New management plan for the Tasmanian Scallop Fishery, 2007, 2008, 2009 and 2010 Commercial Scallop Season, Scallop Catch updates.